This is my fifth day in Granada and, although I’ve spent many hours sitting behind my computer, I’ve managed to do a little exploring as well. So far, I like it here. In fact, I think I prefer Granada to Seville. The landscape is very beautiful, but standing under the hot Spanish sun and starring at snow-covered mountains is an experience that takes some getting used to. I grew up in Yorkshire. I’ve seen plenty of snow, but in England, snow comes during the colder months. If you see it, you know you need to wrap up well before leaving the house. 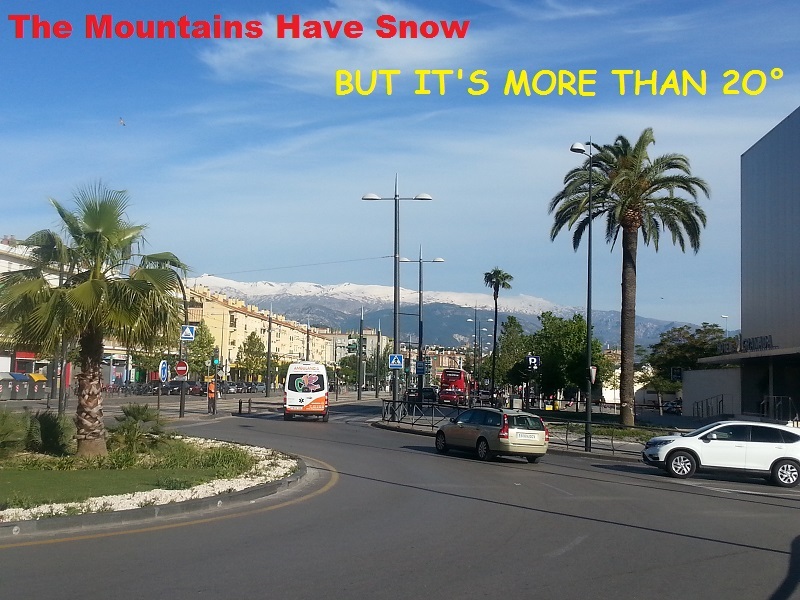 Here in Granada, when I leave the house and look down the street I can see mountains that are white with snow. The temperature is higher than 20 degrees and I’m looking at snow. The river here is also a little different to the ones I’m used to seeing. In some places, the riverbed is practically dry. I like travelling because it gives me the chance to have new experiences and Granada is proving to be quite an experience. There’s a beer and tapas festival in the park near the apartment where I’m presently living. It started today and ends on Sunday. There’s a podium that’s been set up there for live music, so I may go on Saturday. I like live music. I like beer too and have an ever-growing appreciation for tapas. In Granada, €2 seems to be the average cost of a small beer, the same size as a Dutch vaasje or an English half-pint. I know places in Seville where I could get the same amount of beer for half the price, but paying €2 for a small beer is not that bad because they generally come with a tapas in Granada. When I arrived here on Sunday, I did a lot of walking around and worked up a thirst. I went in a bar and asked for a large beer. It only cost €3.50, so that was already pretty good, but the guy behind the bar held up a menu and told me I was entitled to two free tapas. When I go for tapas in Seville, I usually have a friend with me. She knows what all the different tapas are, so I let her order for me. Without her, tapas are a mystery to me. So I picked items one and two on the list. The first tapa turned out to be a small dish of chips with meat and gravy on top. The second one was served in the same type of flat-based dish and consisted of seasoned potatoes with a fried egg on top. Both were extremely tasty and, bearing in mind the fact that I wasn’t hungry, the size of the portions was so generous I would not have been able to eat two more, so decided against having a second drink. Granada is definitely not a good destination for power drinkers. Anyone trying to drink too many beers on the trot would be likely to explode. I found your comment on the Becoming minimalist blog by Joshua Becker. I’m an aspiring minimalist myself. I’m spanish, and I lived in Granada as a child, at Divina Pastora street. I’ve been living in France for 12 years, and I miss Spain so much. I’ve enjoyed your post, it brought me memories. There’s no need to appologise for your English. It’s fine. Granada is a beautiful place, and Spain has a unique and interesting culture, so I am not surprised you feel homesick. France is nice as well though, and after 12 years, I think if you ever return to Spain, there will be times when you miss France.